It snowed last night. Today I woke up to a whole world sprinkled in a light dusting of white. It was spectacular. 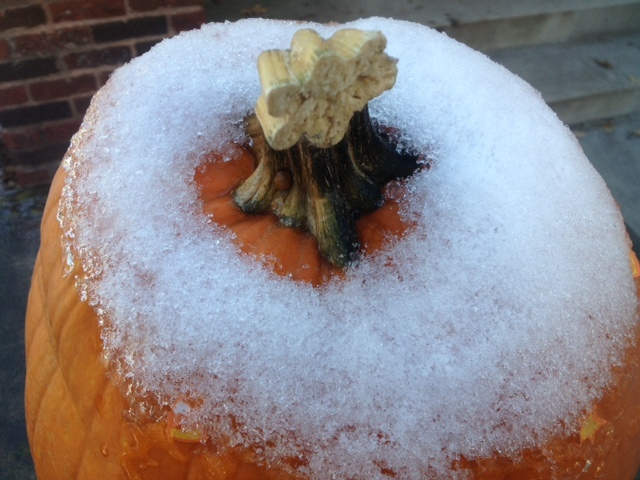 I love the snowy pumpkin as for me it represents the imminent arrival of winter that isn’t too far away. We are still caught in between the seasons of fall and winter. Kind of like my life is feeling right now. Uncertain. No more words for today’s post. I committed myself to NaBloPoMo and have to post something every day for the entire month of November. It is hard to be under pressure but once again it is freeing to use this space right now for what ever seems to be on my mind. We will see what tomorrow brings. This entry was posted on November 6, 2013 by thirdeyemom in BODY, MIND & SOUL, Inspiration and tagged changing seasons, inspiration, journey, Life, NaBloPoMo, reflection.